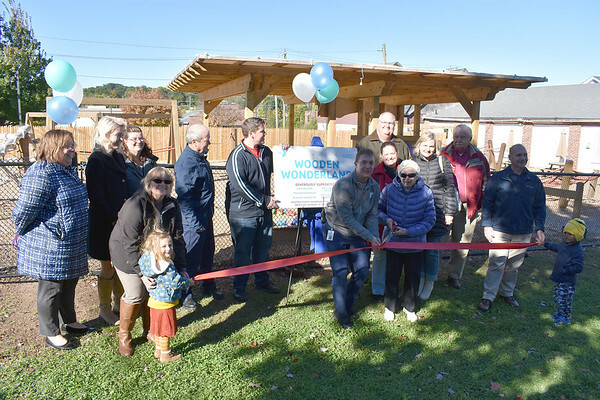 SOUTHINGTON – The Southington Community YMCA opened its newest “Wooden Wonderland” playground last Thursday behind the YMCA Learning Center. The morning began with a welcome by YMCA Board President Dan Daigle followed by a blessing by Suzannah Rohman. The JumpStart to Kindergarten class did the pledge of allegiance, then Katie Sherman and Kari Robarge presented the features and benefits of the playground. The playground is a two-part divided playground featuring numerous age-appropriate climbing, swinging and sand play areas. The division down the middle allows multiple preschool classes and different age groups to use the playground at the same time. The new space triples the existing playground areas of the YMCA Learning Center. Katie Sherman, YMCA Director of Child Development, said that it is important for kids to have time to free play. “Play is essential for dexterity development, learning to make decisions, and working in a group,” she said. 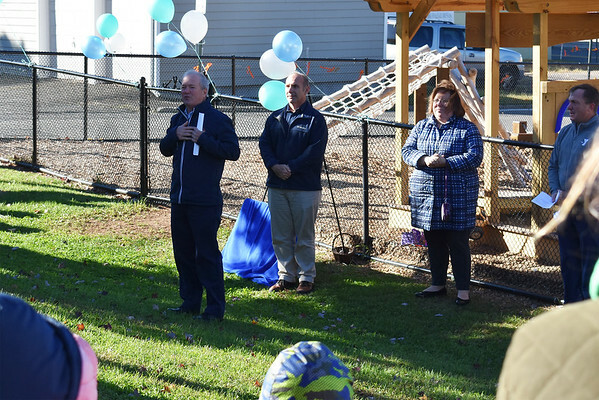 Next, John Myers, YMCA Executive Director and Mark Pooler, Director of Operations said a few words to thank the donors whom made the playground possible. They thanked Clara Bellman, the Katie Dobroczynski Memorial Fund, RF Quinn Foundation, Stocker Foundation, YMCA Learning Center Families and ESPN. Pooler, along with longtime volunteer and donor Clara Bellman, then cut the ribbon. The Southington Community YMCA Learning Center is an 11,000 square foot early education learning facility. It houses preschool, nursery school and “JumpStart to Kindergarten” programs. The building houses seven classrooms and has an additional four classrooms across the street on the second floor of the main YMCA facility. YMCA preschool is open to children 2 years and nine months old or older and is designed to prepare kids for kindergarten through collaborative play, active listening, and enrichment programs including swimming, gymnastics, sports and more. Posted in New Britain Herald, General News, Southington Herald on Monday, 29 October 2018 20:00. Updated: Monday, 29 October 2018 20:03.